santa fe1, originally uploaded by All Things Mimi. Last weekend, Dev and I took off to Santa Fe, NM. 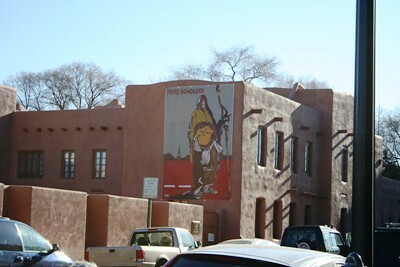 I have decided that if we're going to drive 2 hours to get to decent shopping territory, I'd rather go to Santa Fe, where the food is wonderful and the scenery is even better. We stayed in the plaza district at the St. Francis Hotel, and ate some amazing, amazing food. I didn't take my camera along during meals (I know, when will I learn? ), but we ate at a little sushi place on Guadelupe Street, The Plaza Restaurant on Lincoln Avenue, a little french cafe (I don't remember the name) on the plaza, and Cowgirls, also on Gaudalupe Street. Every single meal we had was over the top good, from the sushi, to the lamb tacos at the Plaza Restaurant, to the quiche at the french cafe, to the burger at Cowgirls. I can't wait to go back and try the places we didn't get to, like Harry's Roadhouse (we've been there before, and it is some of the best breakfast food I've ever had) and The Shed. And I promise, next time I'll take my camera along at feeding time! !